This Mac video converter is fully compatible with Mac OS X El Capitan, Yosemite, Mavericks, etc. It supports a wide variety of video formats, lets you preview the input files, and allows you to merge multiple clips into a single movie. Its video editing options include the abilities to trim, crop or watermark movies, attach subtitles to clips, etc. When it comes to converting the videos, the application takes minimum time to export the clips. Plus, it doesn’t slow down your computer while generating the output files. In conclusion, it’s worth trying this video converter as long as the aforementioned flaw doesn’t mean much to you. The program works with dozens of 4K, HD and SD video formats, offers you quality output files in no time, and comes with a fair price. Memory: 512 MB physical RAM or above. Monitor: 1024*768 or higher resolution display. It supports more than 70 input formats and up to 250+ output file format. Supported output video and audio formats include MP4, MOV, WMV, AVI, XAVC, XAVC S, MPEG, VOB,?TiVo recordings, MXF, MTS/M2TS, FLV, 3GP, 3G2, DivX, XviD, MP3, WMA, WAV, AAC, AC3, M4A and more. This top-ranked Video Converter for Mac supports convert all HD/4K video files including AVCHD, MTS, M2TS, XAVC, XAVC S, MXF, MOV, MP4, etc. to various professinal encoders -Apple Intermediate Codec, ProRes and DNxHD, DVCPRO, HDV, MPEG-2- ensuring maximum editing quality and efficiency when working with iMovie, Final Cut Pro, Avid Media Composer, Adobe Premiere and more. Pavtube Video Converter for Mac supports 150+ presets for popular devices like the iPhone (including iPhone 7, iPhone 6s Plus, iPhone 6s), iPad, Android devices (Nexus 7, Nexus 9, Amazon Fire HD, Samsung Galaxy Tab, Nook HD), Windows-based tablets and game console, etc. 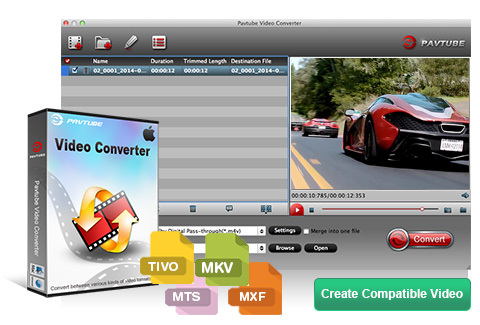 Far more than a Mac video conversion program, Pavtube Video Converter also comes with a built-in video editor, with which, you can personalize and retouch your videos in clicks. Pavtube Video Converter for Mac supports decoding H.265 source files for playing, editing and sharing, encode other files to H.265 MP4/MKV for better streaming, playing and storage. Convert multiple files at a time to ensure an efficient conversion. Play any video and audio files; no extra codecs needed.